Are you confused about the stroke order of 车 and 牛? If not, it’s either because you haven’t noticed the unique behaviour of these two characters, or because you have noticed it and been able to sort it out. In this article, I intend to make sure we’re all in that last category, regardless where you started! Question: Is the last stroke of 车 and 牛 vertical or horizontal? The answer is that it depends. Normally, when written as individual characters for example, they should both end with the vertical stroke (see image below). This is also true when they appear in other characters where they retain their original proportions. However, when they appear in their slightly altered left-of-character component form (偏旁), they aren’t written the same way. Instead, the order of the two last strokes is reversed, leading to horizontal, vertical, horizontal (or actually upward) strokes. It should be noted that this is relevant for traditional characters too, but only for 牛 since 车 is written 車, which doesn’t acquire the alternate form with an upward stroke and therefore always finished with the vertical stroke. Why this difference? Try it yourself! If you try the two variants yourself, it’s not hard to realise why this is the case. The upward stroke that should end the slightly squeezed variants are only part of the character and whatever part follows it will be written from the top down, so it’s the natural direction to take after finishing this component. Compare with 扌, which has a similar feel to it, very likely for the same reason. 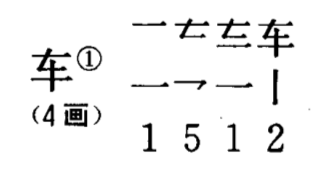 It should be much less common confusing that stroke order for the one in 手, simply because they are clearly not identical apart from being differently proportioned. This makes even more sense if you consider that characters used to be written in columns from top to bottom (still often are in many places). So, in future, don’t be confused when you see these stroke orders change in Skritter or elsewhere! It’s not the case that some sources say you should use one stroke order over the other, it simply depends on the character your looking up. In particular, it’s determined by if it’s a left-side component or not.